Highlighted by their singing of Japanese superstar, Shohei Ohtani, the Los Angeles Angels are coming off of a very strong offseason, and by the looks of secondary market Angels ticket prices, fans can't wait for the season to begin. According to TicketIQ.com, Halo's fans will pay an average of $112 on the secondary market to see the Angels play at home in 2018. 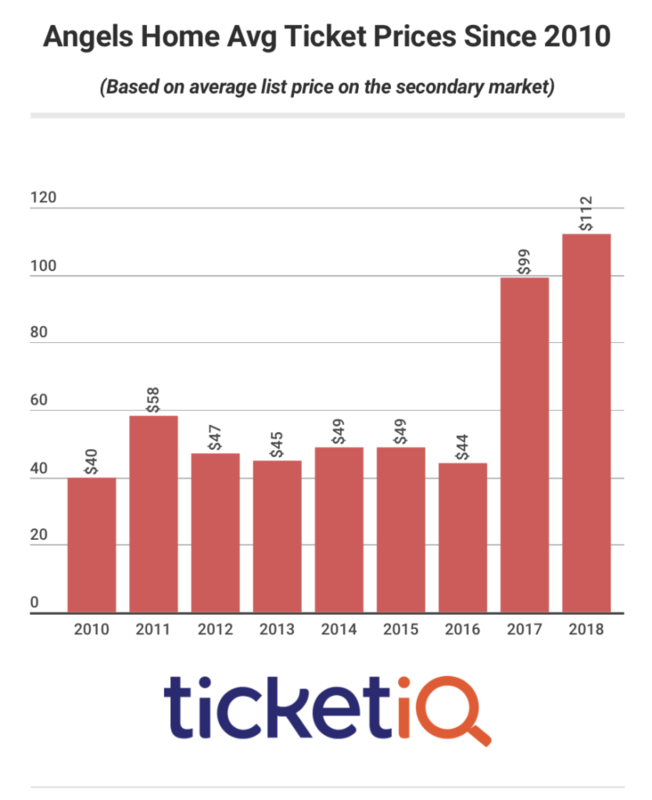 That represents a 12 percent price hike from 2017, when the average price of a ticket on the secondary market was $99. Prior to 2017, the average cost of a ticket was below $50 -- $44 in 2016 and as low as $40 in 2010. Opening Day tickets tell a similar story. It will cost fans an average of $153 to see the Angels host the Cleveland Indians on April 2 in Anaheim. The Angels open the season on the road at the Oakland Athletics on March 29. The cost of an Opening Day ticket is nearly 34 percent higher than it was last year when the Angels played host to the Seattle Mariners and fans paid $114. The highest Opening Day ticket of the last decade was in 2016, when the Chicago Cubs visited the Angels for the first game of the season at Anaheim. Fans at Angel Stadium can look forward to a spike in home runs this season, after the team announced that it will be lowering the home run boundary on the right field wall to five feet. According to MLB.com, the expectation is that there will be 8.5 percent more home runs this season, though the wall itself will remain 18 feet high. That 8.5 percent translates into about 16 more home runs per season. Opening Day at Angel Stadium features the Angels first promotion of the season – the team will give away Angels wall calendars.